You are in luck — it is, usually, mostly air. With some wood here and there, often… though sometimes there’s steel instead of wood, and sometimes it’s concrete. Or glass — but that part’s usually called a “window”. I’ve heard cases where people have driven nails into the water pipes. Depending on how neatly the nail goes in, it can actually sometimes hold for a little while, before corrosion and pressure makes the pipe fail and the wall fill up with water. If in doubt, use a stud finder and make sure you’re going through the wallboard into the wooden stud, and only as far in as you have to to support the weight of the picture or whatever you’re hanging. Water pipes might pass through notches or holes in the studs, but usually they’ll be in the spaces between them. It’s only a matter of time before my neighbors will drill holes in their wall (or ceiling, if we’re talking about the guy in the apartment below) that will reach our apartment. It seems like my neighbors want their apartments to look like huge pieces of cheese! Or today will be the day you find the previous owner of the house who mysteriously “disappeared” years ago. Apparently, Biff has an e-reader or iPad in his hand. 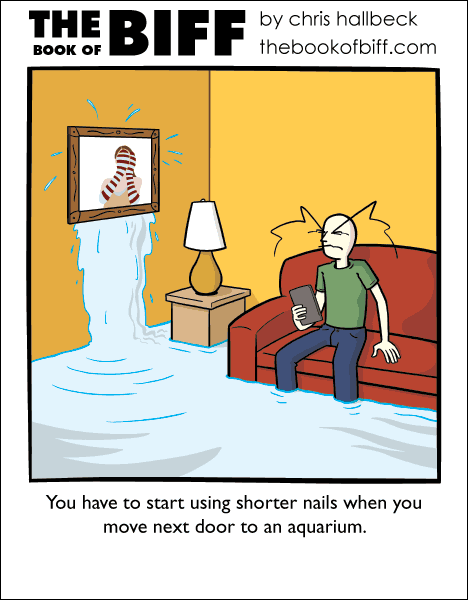 Nonetheless, I would be very careful when moving next to an aquarium. I like the Ali Cavanaugh painting! Thirded! Biff has good taste! biffs’ been having a lot of trouble with aquariums lately, hasn’t he?